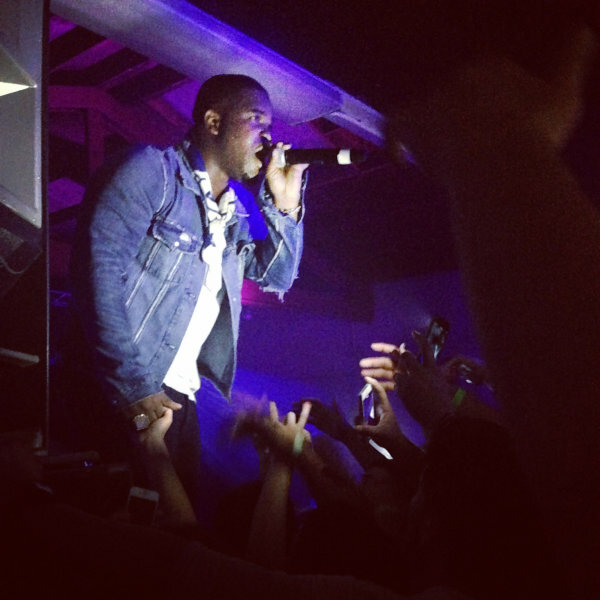 CROWD CONTROL: A$AP Ferg ignited some friendly, sweaty moshing during his Tuesday night show at La Casa de la Raza. When most saw the line around the block, they worried. The venue, La Casa de la Raza, was at capacity, at a number significantly higher than a “sold out” show that took place there a few years earlier. Inside the climate was hot and muggy as supporting psychedelic hip-hop act Flatbush Zombies finished their opening peformance. The Zombies would later reemerge during a break between sets, which stretched on in order for everyone outside to get in. Meanwhile, the Flatbush fellas took to the merch table to sell their remaining small and extra-small tie-dye t-shirts and engage with fans in a manner that was entirely cordial and earnest. Things were lit and passed at the back of the expansive room, while the DJ offered up a pre-show collection of tracks from Chicago’s Chief Keef, Atlanta’s Future, and Kanye West. After a few short conversations the Zombie departed, distributing daps, hugs, and selfies all the way to the door. Despite the crowd’s imposing size (and relative hostility) at the door, once inside everything remained harmonious, save for one attendee, who took to standing on the merch table to see the show better. When A$AP Ferg finally made his entrance at a little past 11 p.m., the eruption from the crowd was contagious — not aggressive, but wholly celebratory. In order to better see the whole crowd from the nearly floor-level stage, Ferg stood atop some sort of platform, beside a tower of a sparks, looking appropriately Pontiff-like. A$AP shows have a reputation, much in the same way Odd Future shows do. That is to say, these are mosh shows, and A$AP Ferg’s command of the mosh-pit, like Moses over the Red Sea, was truly a sight to behold. The floor opened up at his command, and kids were more than happy to chant the hooks to singles like “Shabba” and “Work (Remix)” as he reigned over the proceedings. “If I come and party with you, will you take care of me?,” he asked before leaping into the crowd, where he floated atop the crowd for what felt like an hour.